Harry Cornick's first half goal ensured Luton's name is in the hat for the FA Cup third round draw on Monday evening after a battling 1-0 win at League Two Bury this afternoon. The Hatters could count themselves somewhat fortunate to be on level terms in the first half, with Bury having the better of the opening 20 minutes, but after hanging in there, once Cornick put them in front, they produced a fine defensive display to stifle their usually freescoring hosts. 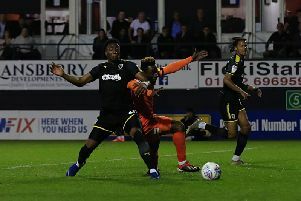 Luton went as strong as they could for the game, naming an unchanged side for the fifth match running, although Kazenga LuaLua was back on the bench after missing the last two matches. The hosts showed first, in-form Nicky Maynard finding space and with one thing in mind, fired narrowly over the bar from 20 yards. Luton's best opportunity came on nine minutes, James Justin's corner met by Glen Rea, his glancing header not missing by much. Maynard had a glorious opportunity shortly afterwards, as Byron Moore reached the byline and pulled it back to the striker just six yards out, his weak attempt well saved by James Shea. The Luton stopper should have been picking the ball out of the net on 18 minutes though, Neil Danns dumping Sonny Bradley on his backside with a lovely turn in the area, dragged badly wide with just Shea to beat. Maynard sent an ambitious curler off target, while Town finally got a grip on proceedings and stopped Bury's supply-line to Maynard and Moore. It worked a treat too as with the Hatters starting to pick up possession in advanced areas, they took the lead in the 42nd minute, courtesy of a lovely team goal started by Pelly-Ruddock Mpanzu. He moved the ball on to Elliot Lee, in turn finding James Collins who had peeled away to the left of the area, executing a perfect low cross for Cornick to tap home for his second goal in as many games. The scorer should have put Luton 2-0 up on the stroke of half time, when Hatters broke from a Bury corner. Played by James Justin, he was faced with Joe Murphy, but with Lee screaming for a cut back, went for goal himself and ended up skying wildly over the top, to the frustration of his team-mates. After the break, Andrwe Shinnie fired into the stands, before on 55 minutes, Cornick almost doubled the lead when the architect Lee picked out Jack Stacey's overlapping run, but under pressure from two defenders, his effort was easy for Murphy. Cornick continued to cause the hosts trouble, keeper Murphy just beating him to Mpanzu's marginally overhit through ball. The Shakers remained patient in their attempts to break down Luton's back-line and should have done with 18 minutes to go, Adams finding Maynard whose low ball saw sub Dominic Telford fire over the bar from no more than eight yards. Town themselves should then have put the tie beyond doubt moments later, as Stacey's run was picked out perfectly, his delivery met by Collins from seven yards, Murphy making an excellent stop with his legs. Adam Thompson looped a header on to the roof of the net, while Callum McFadzean's blast from the angle was straight at Shea as the Hatters shut up shop effectively, preventing the hosts, who had netted 22 goals during November, any real opportunity of forcing a replay. Shakers: Joe Murphy, Chris Stokes (Tom Miller 83), Adam Thompson, Eoghan O'Connell, Nicky Adams, Danny Mayor, Byron Moore (Dominic Telford 58), Callum McFadzean, Jay O'Shea, Neil Danns (C Caolan Lavery 74), Nicky Maynard. Subs not used: Scott Moloney, Will Aimson, Stephen Dawson, Chris Dagnall. Hatters: James Shea, Jack Stacey, James Justin, Matty Pearson, Sonny Bradley, Glen Rea (C), Pelly-Ruddock Mpanzu, Andrew Shinnie, Elliot Lee (dan Potts 83), James Collins, Harry Cornick (Danny Hylton 87). Subs not used: Marek Stech, Alan Sheehan, Lloyd Jones, Aaron Jarvis, Kazenga LuaLua. Booked: Shinnie 19, Rea 48, Mpanzu 55, Bradley 82.